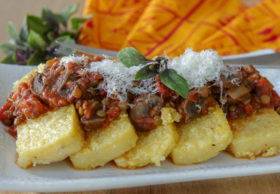 Sweet jebus, this is the best vegetarian recipe I’ve ever come up with in my entire life, I think. Sopes are kind of a thick corn tortilla “boat” filled with all kinds of stuff, but usually there’s some refried beans involved. I used guacamole for these vegetarian sopes but feel free to swap that for refried black beans (or use both!). 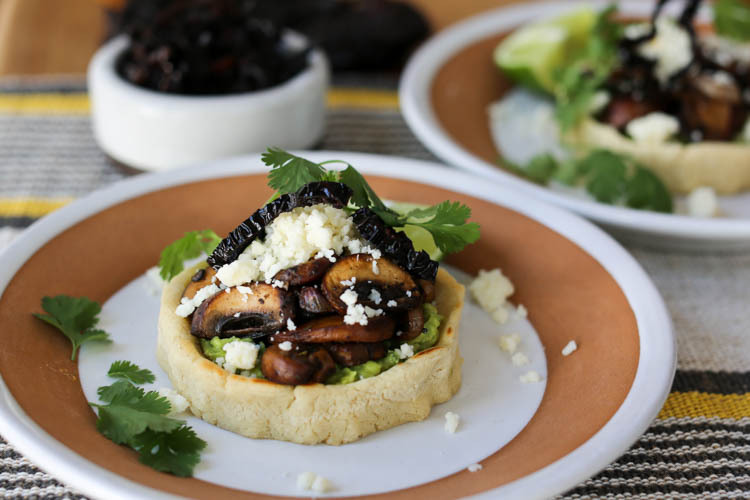 My vegetarian sopes have warm sauteed mushrooms and cool guacamole, topped with crisp fried ancho chile strips and cotija cheese. 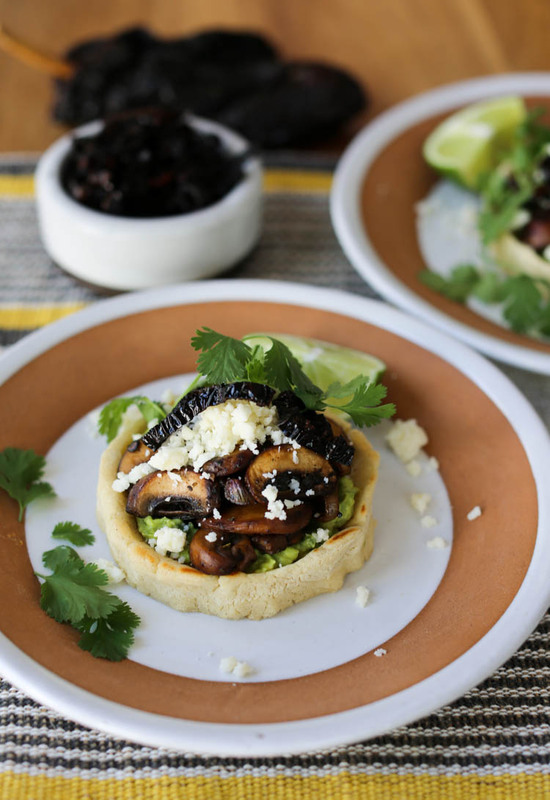 Omit the cheese and these vegetarian sopes magically become vegan sopes! The fried ancho chile strips really make this something special. On their own, if you try them, they are fruity up front then have a long, bitter “tail” but the bitterness is balanced here with sweet, creamy avocado and salty cotija cheese. If dried chiles are too hard to find where you are (I hear there’s a dearth in Europe!) try sprinkling some toasted pepitas or even sunflower seeds on top for crunch. And if you can’t find cotija cheese, use a firm feta cheese instead. Please try these with wild or “fancy” mushrooms if you can get em. I just use cremini because they’re easy to find but shiitake or maitake or a combination would be great! I love these with my homemade chile de arbol salsa but any similar salsa is great if you like it spicy. 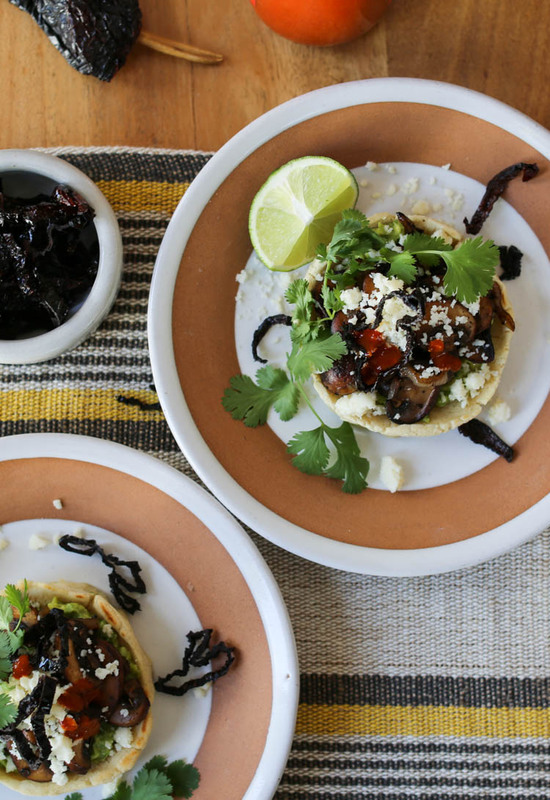 This recipe makes four sopes, which feeds two people as a main dish or four as an appetizer. 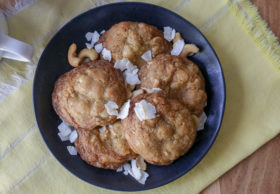 You could also make even smaller bite-size sopes which is a lot more work but would make a really cute passed appetizer for a party. Set oven to 350ºF. Make the masa: Mix with warm water and salt o make a soft but not sticky dough. You may need 1-2 extra tablespoons water to fully moisten the flour. Cover and set aside for 15 minutes to fully hydrate. Meanwhile, wipe and clean mushrooms. Slice them and slice the shallot. Quickly rinse the ancho chile to remove any dust and pat dry. With a very sharp chef knife, slice it thinly into rings or strips. Shake the seeds away as well as you can. 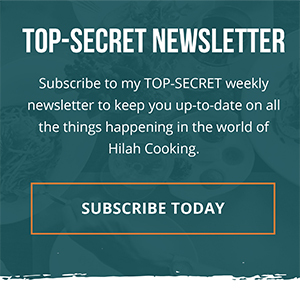 Heat the tablespoon of oil in a large heavy skillet over medium-high heat. Once fairly hot, add the chile strips and fry for 2-3 minutes until very fragrant and they begin to turn a more reddish color. Remove from skillet, leaving as much oil as possible behind. Add the butter to the skillet and once melted, add sliced mushrooms and shallot, salt, pepper and oregano. Cover and let cook about two minutes. Stir. Mushrooms should be quite brown and softened. Cook another minute or two until they are fully soft. Deglaze with tequila, if using. Turn off heat. Make the sopes. Divide masa into 4 portions and roll each into a ball. Flatten balls into discs about 3 inches across. I use a 1/4 cup measuring cup to mark my center by pressing it into the middle of the disc to make a little crater. Then use your fingers to mold it into a circle about 4 inches across and pinch the little “lip” up around the outer edge that is 1/4-1/3 inch (1 cm) taller than the center. Heat the oil on a griddle over medium heat and cook the sopes, flat side down, for 3-4 minutes. Flip and cook the other side for another minute, careful not to crush the lip. Transfer to a baking sheet and put into the oven for 15-30 minutes. Meanwhile make the guacamole: Mash avocado with 1 tablespoon lime juice (should just need half the lime) minced serrano, half the cilantro and 1/4 teaspoon salt. 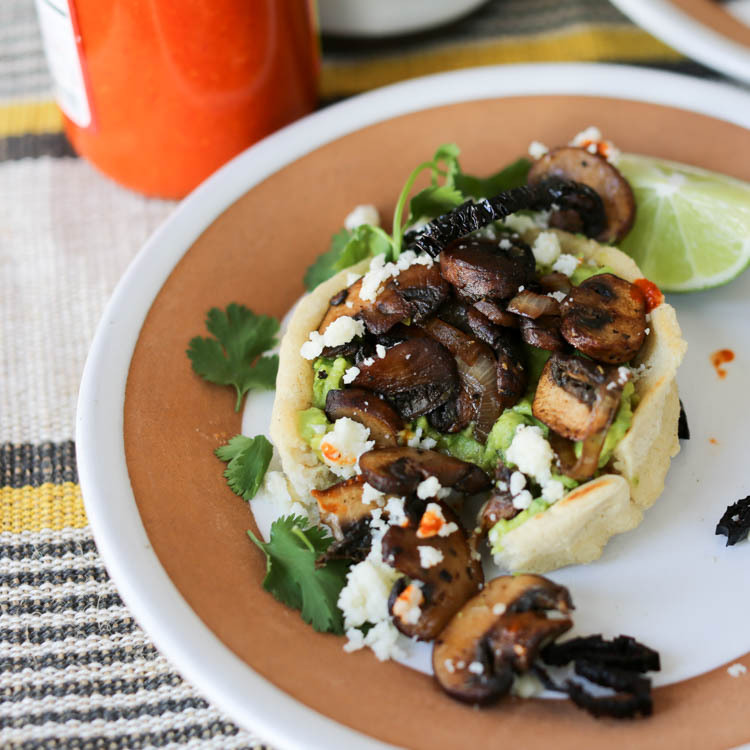 To assemble: One hot, toasty sope (cup side up) spread with cool guacamole, top with warm mushrooms. Sprinkle with cheese and ancho chile strips. Serve right away with lime wedges and hot sauce. 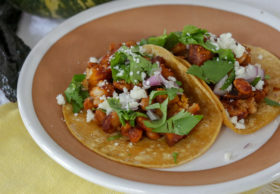 Serve with lime wedges, hot sauce, additional ancho chile strips. Wensleydale in the UK is a wonderful substitution for cojita. It’s crumbly, but smooth, salty and less funky than what feta brings into the mix! This looks amazeballs. 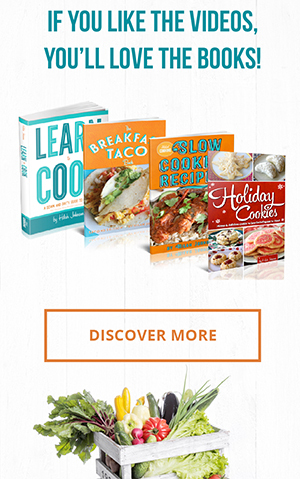 Time to order some masa from Amazon!